Shompole eco lodge is located in Southern Kenya on the Tanzania border near Lake Natron, overlooking the Great Rift Valley. Much of the incredible landscape was shaped by volcanic movement. The lodge, situated on a private conservancy, is surrounded by 140,000 acres of Shompole Group Ranch, including a diverse area for wildlife and a buffer zone for human settlement. The lodge was constructed to enhance the natural beauty of the area with flowing water, smooth white walls, and mostly open air. Each room consists of a cool-pool, informal sitting area, a bathroom, vast windows offering views of the volcanic mountains, and a high canopied roof. The rooms are designed to be open in order to take advantage of the breeze. The main lounge and dining area have a high thatch roof and overlook the Great Rift Valley. Guests can also enjoy their meals in the privacy of their rooms, at the main pool, or in the bush. If you wish to celebrate a special occasion the staff at Shompole can organize a candle lit dinner under the stars, which is sure to be a truly unforgettable experience. Shompole was designed to allow guests to relax in a beautiful environment and enjoy the natural surroundings and sounds of the bush. However, there is no shortage of activities. Shompole is located in one of the most diverse environments in Kenya. Since the eco lodge is located on a private conservancy, guest can enjoy walking tours, viewing the local flora and fauna with an experienced guide to inform them about the surroundings. Walking tours generally take place in the morning or evening, when it is cooler. Canoes are also available for a leisurely afternoon drift down the Ewaso Nyiro River, which is lined with yellow fig trees. Other activities offered are game-viewing and mountain biking. Wildlife in the area includes lion, buffalo, leopard, giraffe, eland, wildebeest, gazelle, zebra, cheetah, elephant and many more. Night drives are also offered for the opportunity to see more of the rare animals. Lake Natron is one of the only flamingo breeding grounds in Africa. The lake reflects a deep red color from the algae the birds feed on and has been named the Lake of Fire by the Maasai. The temperatures range from 64 to over 100 °F, with long rains in April and May, short rains in November and the hottest months being March and October. The lodge is informal so dress for comfort. We recommend bringing a hat, sunscreen, binoculars, a camera, and comfortable walking shoes. The Shompole South Airstrip is located 10 minutes from Shompole. The eco lodge is also a short 30 minute flight from Nairobi, the Mara or Amboseli. By road Shompole is a 3.5 hour drive from Nairobi, with breathtaking views across the Great Rift Valley, including Lake Magadi. Little Shompole is composed of 2 private suites a short walking distance from the main Shompole lodge. Each suite offers guests complete privacy and luxury, with a lounge area, cool-pool, and a spacious sun deck. 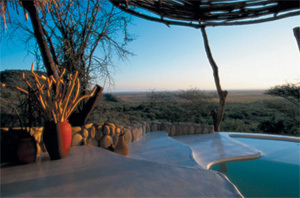 Both suites share a horizon pool that overlooks the Lake Natron basin and the volcanic slopes. Guests will enjoy a dedicated team of staff, including a private guide and butler. A recent addition to the Shompole properties, Shompole House accommodates four people and offers stunning views, a relaxed atmosphere, private dining, and a private swimming pool. Built mainly from local materials, the master bedroom is spacious and has an open design similar to the designs of the main Shompole lodge. Guests can enjoy all activities offered at the main lodge. Shompole is part of a project with the local Maasai community that is dedicated to ecotourism and preserving the area. The Maasai remain traditional in their lifestyle, and welcome guests to visit their villages. The Maasai hosts are happy to share their culture and traditions. Guests can visit Shompole village on market day as well as visit a bead-hut, where Maasai woman gather to work on clothing and accessories that are sold overseas and provide income for them. Shompole also supports the local economy by training and employing those from the local communities. They have also set up the Asali Community Trust, which aims to provide funding for social development projects in rural communities.